My friend Laurent Martin ownes HPD 385A 's. 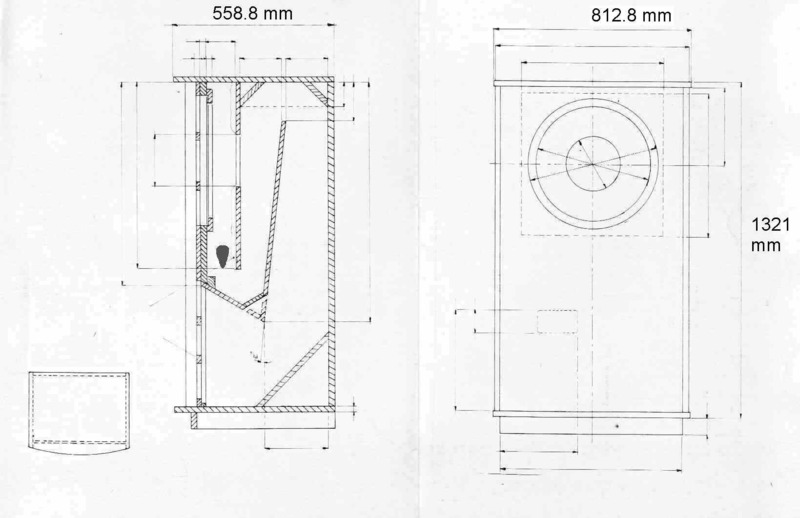 He constructed the 300 Litre horn loaded cabinets on the picture below. These cabinets are made of wood and marble and their design is based on the Tannoy rectangular GRF. As you can see the the baffle is made of marble. Above the Tannoy a Decca London ribbon speaker is mounted to enhance high frequency response of the system above 15 KHz. 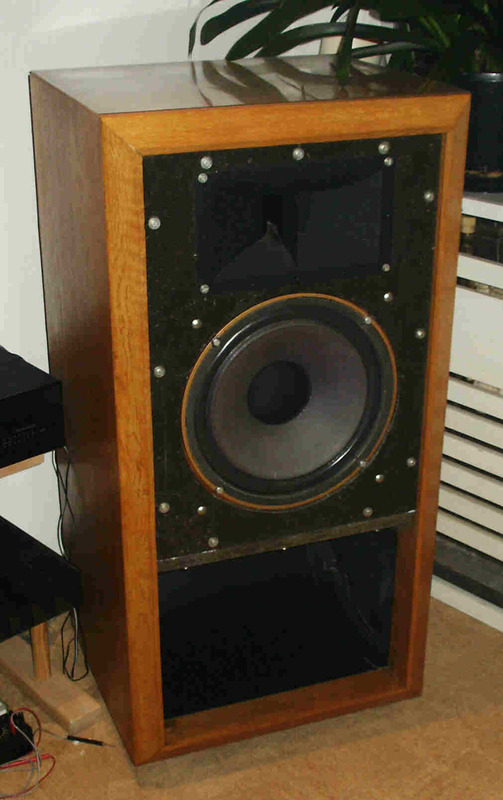 This Decca London speaker is not included in the measurements. but in our view it must be incorporated in the design. It is a "tear drop" shaped beam to work as start of the horn and as a barrier to end the compression room behind the speaker. This works extremely well, only lows are entered in the horn. Also tuning can be done with the size of the drop. 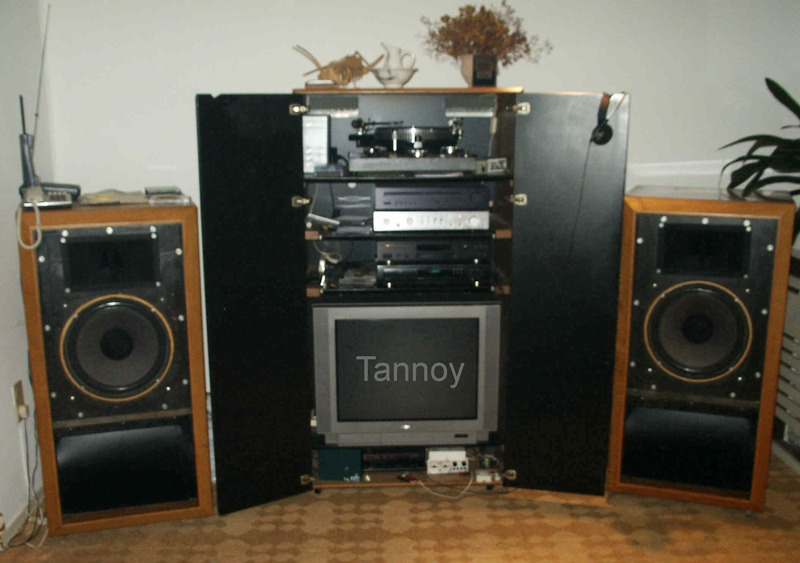 This design is the basics Laurent used, it is derived from the basic Tannoy R-GRF cabinet, with some modifications. for more dimensions info of this cabinet see other pages on this website. if you do not use it you will experience that mid frequencys enter the horn and give severe colouration of the soundimage. with a second backpanel of the same properties as the existing back. The bottom of the so created 4 spaces was closed and we filled the spaces with sand. This way you get the back panel silent and stable. Quite the same way as my MG15 closed cabs. this reduces turbulence in the horn and so distortion of the sound. Cover the teardrop beam with felt of approx 1 mm thickness. 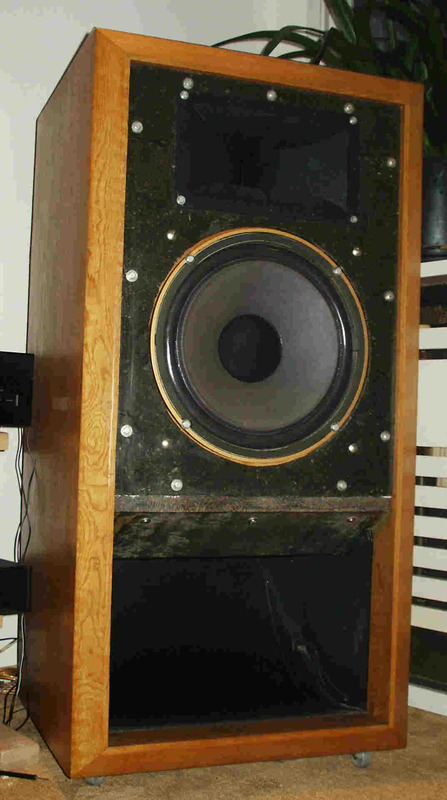 Damp the room behind the speaker as good as possible without reducing its volume too much. 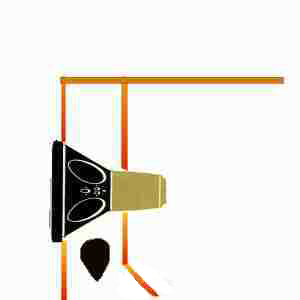 Fill all unused spaces of the cabinet created by the shape of the horn with damping material. hight: 4 to 5 inches ~ 10 to 12 cm - width: 2 to 3 inches ~ 5 to 8 cm - length: width of the cabinet. you might have to experiment with the values. Laurent mounted the x-over outside the cabinet, after modification, quite similar to the MG 15 mod. 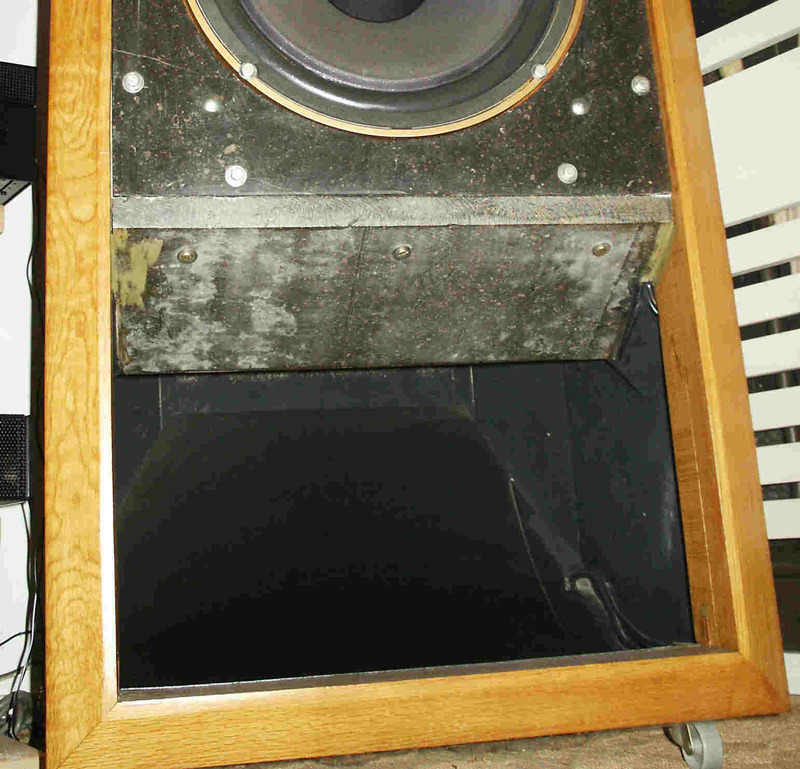 This cabinet us usable for all models 12' and 15' Tannoy speakers. We did the measurements on these systems, following the same procedure as the measurements on my Monitor Golds. Above the response curve of the HPD 385A in the 300 L horn loaded cabinets with unmodified crossover filters. Be aware of the fact that this is NOT the system response. To complete the system response curve we measured also the output of the horn, scale is 5 dB. one can conclude that the system response curve must have a slightly tilted bass response below 300 Hz. but a sensible system curve is not measurable under the given circumstances. 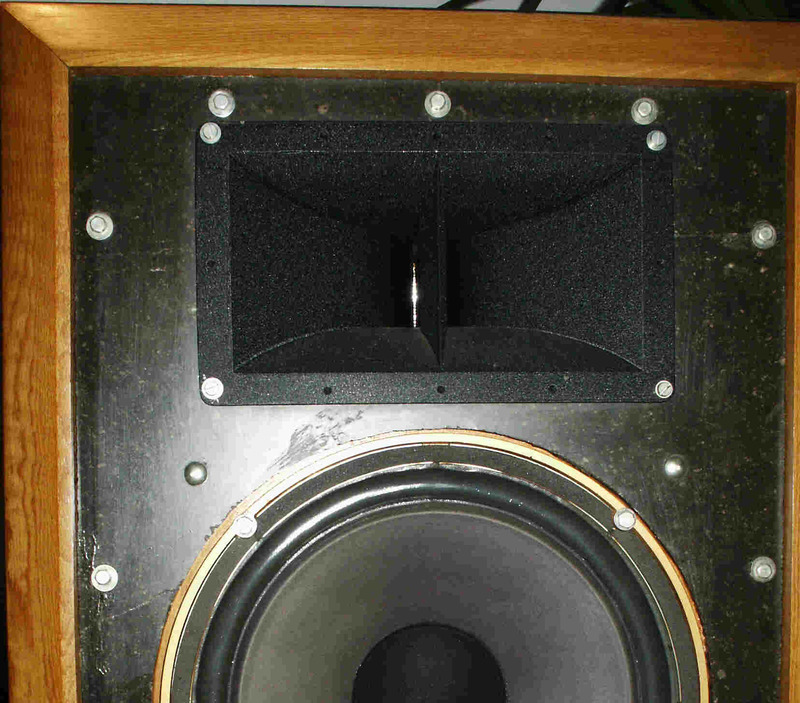 This way of measuring horn loaded cabinets is quite common, scale is also 5 dB. virtually no rolloff below 50 Hz, the -3 dB point is approx. 25 Hz. Listening to these systems give a deep and impressive low performance, that the closed cabinets lack. Many thanks to Laurent Martin for his indispensable help and support. Misoslav entered params of Laurent's horn into Hornresponse software and got the above curve that is quite in line with the measurements we did. © Hans Hilberink PE1MMK ® & Laurent Martin, 2003, last update: 06-04-2011.